I've been enjoying my creativity when it comes to cooking. I have a few recipe posts on here, but only one of them I made with my own recipe. If you want to checkout my barbecue sauce click here: My Barbecue Sauce Recipe! 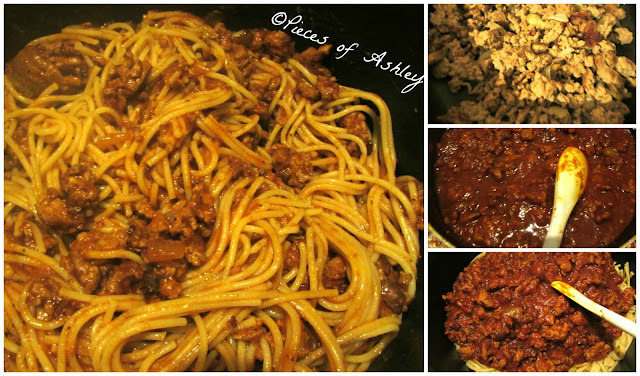 So this time I will share with you my spaghetti with ground turkey recipe. It's very simple and only needs a few ingredients. You are more than welcome to adjust or change the ingredients and measurements. Most of the time I don't measure I just eyeball it, but I wanted to share with you so I made it into a recipe! I used 1 tomato paste with no salt and the other one with salt. The other paste is flavored with roasted garlic. Sauce works fine with this, I just didn't have any. I also used Muller's spaghetti, just because. But you can use another spaghetti or pasta. I do not use this meat sauce just for spaghetti. Also this is good with ground beef as well or sausage. The only thing I would add is the onion and the pepper. The sausage already has enough flavor, at least for me. Let meat sauce cool: 10 min. 1. Put on the water for the spaghetti. 2. Turn the stove on medium heat and add the oil to the pan. When it seems like the oil is hot, add the ground turkey. Cook the ground turkey for 10 minutes. Then you add the chopped onions to the pot with the ground turkey and cook them together for about 6 minutes or until both ingredients cook down. After add the onion powder and the black pepper and stir for about 2 minutes. 3. Then you want to add the tomato paste and stir it in for about 1 minute. Then you add 1 to 2 cups of water and stir it all together (If you want, you do not have to stir in the paste until after you add the water). After that you want to cover the pot, lower the heat, and let it cook for 40 minutes (stir every 8 to 10 minutes). While the meat sauce is cooking check the water for the spaghetti. 4. The water should be at a boil (if not wait till it gets there). Then add your spaghetti and cook it according to the directions on the box. The spaghetti should be done before the sauce, so while your waiting drain your spaghetti. You can put your spaghetti back into the same pot. 5. When your sauce is ready cut the stove off and let the sauce cool for about 10 minutes. Don't worry it will still be hot. After the 10 minutes mix the meat sauce into the spaghetti. If you want to be fancy, sprinkle some parsley into the spaghetti. Even better, if you don't want the parsley stir in some basil to the meat sauce while it's cooling down.